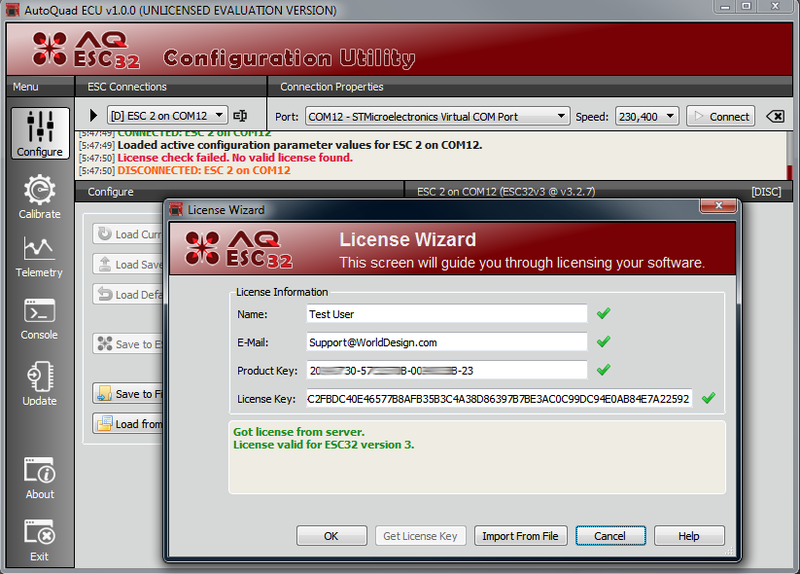 The License Wizard dialog will automatically appear the first time you connect to an ESC32. It will also appear if you try to connect to an ESC32 v2 but the current software license is valid only for ESC32 v3. In addition, you can access the License Wizard anytime by pressing Alt-Shift-M in any main program window. Person or organization to whom this product is licensed. A valid e-mail address at which you can receive mail. A license file will be sent to this address for your records. This can also be used to retrieve a license key in case you misplace it. A Serial Number from a ESC32 v3 device. The easiest way to get this is to connect an ESC32 v3, and the serial number will be automatically detected. You can also find the serial number on a label that came with your device.Note: If you enter an ESC v3 serial number here yourself, you must add “-23” (without the quotes) at the end. For use with ESC32 v2, you must purchase a license. For more information, see the product Web page. The License Key must be obtained through an online license generator. This will be done for you automatically when you click the Get License Online button in the wizard. You can also paste a license key here if you already have it from another source. To retrieve a lost license or to obtain a new license key using a Web browser, visit the Product Licensing Web page. This button is available only when the license shown in the Wizard is valid. Be sure to use the OK button to finish licensing this product. to an online license server in order to look up your license key. You must have an active Internet connection for this to work. this product the first time. You may also download a license file from the Product Licensing Web page. Cancelling the dialog (or closing it with the window’s Close button) will close the License Wizard without saving any of your changes. This page was created on 18-Aug-15 by MaxP. Last modified on 23-Aug-15 by MaxP.